When Weather matters. Are we acting properly upon forecasts? This [free as pdf] NAP book is a report from the 2008 NRC Board of Atmospheric Sciences workshop: “Progress and Priorities of U.S. Weather Research and Research-to-Operations Activities”. Do we need to improve our capabilities? Can we? The report says yes. What can we do? Once we have the forecast of an impeding weather event, are we acting accordingly upon predictions? The reports says not really. 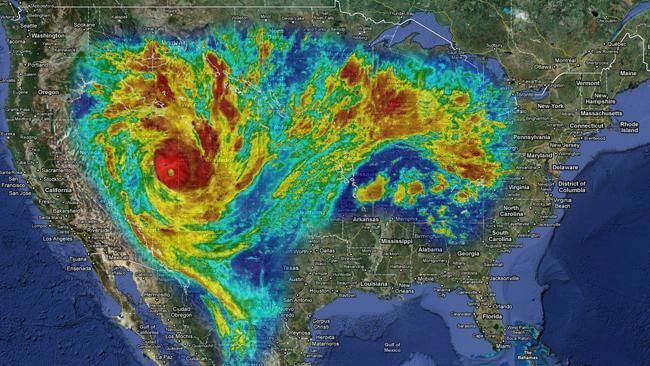 The U.S.A. has the world´s most sophisticated and well-developed weather forecast infrastructure. The federal government also spends, annually, $5 billion in research and operations only in NOAA, and $6 billion for an dedicated agency on disasters (FEMA). Academia and private partners are also tightly involved. Only the generation of weather forecast cost overall $5 billion annually, but its benefits are (quoted on the book as) 6 times the cost. Despite these impressive benefits on paper, there is much room for improvement. 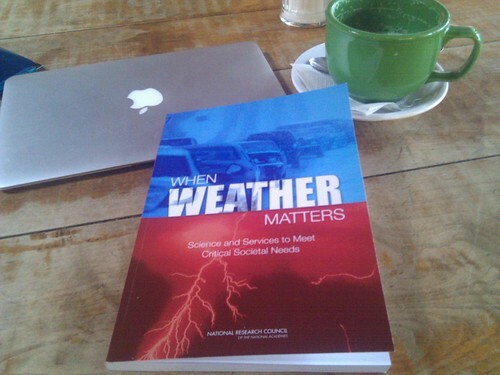 In research, spatial and temporal mid- to long-range weather forecasts remains elusive. So do rare but important events like volcanic ashes. Regarding operations, specially responding to natural disasters, recent history has shown there is much room for improvement. The mismanagement of Katrina is most prominent, despite the fact that there was an almost perfect 48 hours path forecast. "Research to operations" transition should include social scientists. Invest in developing better models to improve forecast accuracy and range. National deployment of upgraded network of measuring station. Intensify resources based on population density. Create an urban meteorology initiative. Support renewable resources of energy, on research, operations and transfer to private sector. Lastly, I would like to point out that the book has a very interesting Appendix on “Gaps in Knowledge and Practice for the next Decade in Urban Meteorology”. Update: Posting this yesterday seems very timely, as today Cyclone Yasi breaks in all headlines around the world. You can indeed see an early warning, track forecast and impact predictions. Is it enough information? What else do we need to predict? and on the other hand, What is being done? Is it enough? Only time will tell us. Land fall has just occurred as I write this, with 10-minute sustained winds of 215 km/h and gusts of 295 km/h. The cyclone is huge, but so is Australia. For comparison I´ve just seen a satellite atmospheric map, but shifted so that the storm is over USA. Daunting.